Recess by Narciso Desmadryl from Perkins Bacon Plates 1854 (Jan-Feb): 5 c. "chocolate" brown, fine impression, wmk. pos. 1, the famous unused example with huge margins on three sides and close but clear at upper left, printed in this resonant shade of very deep reddish brown on quadrille paper, most probably at the very beginning of the print-run; fresh and very fine, without gum. 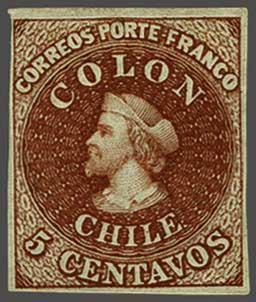 Illustrated in 'Chile, The First Postage Stamps' by Gerhard Blank on colour plate 3. A delightful stamp, finer than the Galvez example, of great beauty and rarity with just 5 sheets printed (1'200 stamps). Cert. 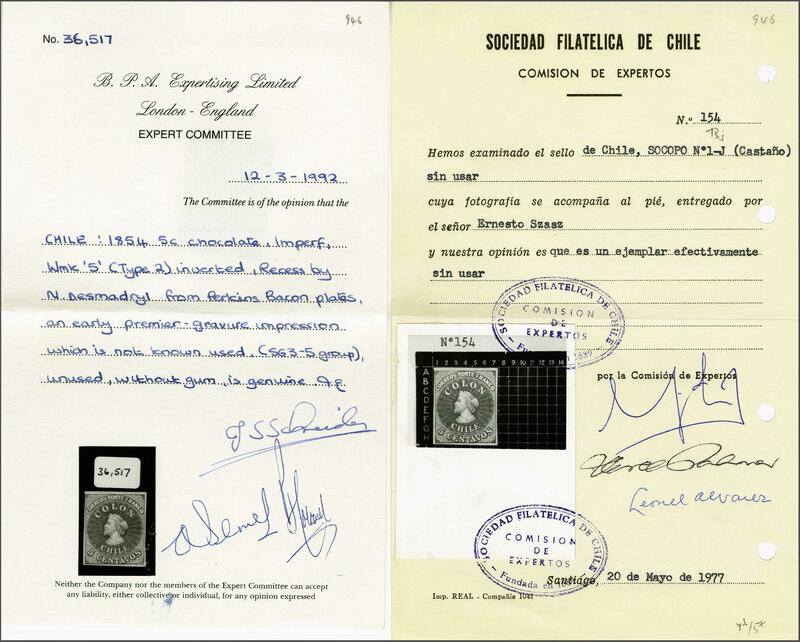 Sociedad Filatelica de Chile (1977), BPA (1992) Scott = unpriced.rnProvenance: Collection Alfred H. Caspary, Harmers, June 1958, lot 616; Collection Gerhard Blank, RL, Dec 1991, lot 946.